I love Hawai’i. That’s not just a saying on a T-shirt; I really mean it. I’ve been multiple times to different islands, and no matter where else in the world I travel, I always love going to Hawaii. We recently spent 10 days traveling with Hawaiian Airlines and visited four of its destinations. Our first stop was to the place where I got my very first taste of Hawai’i back in 1992. Twenty-two years later, I still have a great time in Honolulu. Honolulu, Hawai’i, on the island of O’ahu is full of people, excitement, and a combination of new and old that seems to just mesh seamlessly. 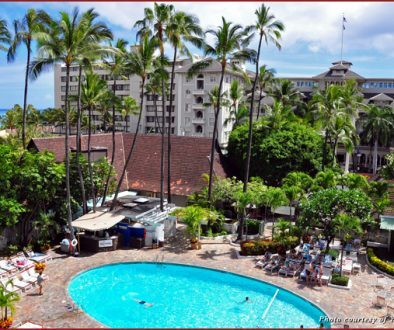 We stayed at one of the premier hotels in the city, the Sheraton Waikiki Hotel & Resort, a Starwood Property. 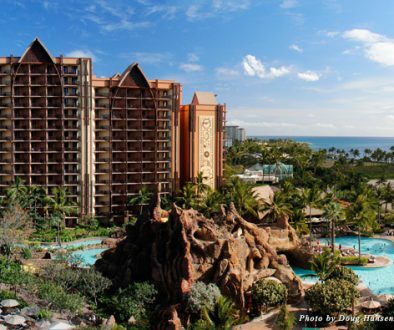 This hotel really offers guests everything they might need, from an adults-only infinity edge pool to a full-fledged water wonderland called Helumoa Playground. The hotel has six different food offerings, including RumFire and the culturally inspired Kai Market. There is tons of shopping just outside the front doors and great views of Waikiki. Even though the Sheraton is one of the busiest hotels in Waikiki Beach, there are a few spots where guests can find some quiet time. At the Leahi Club Lounge on the 30th floor, guests can have a cocktail and gaze over Waikiki all the way to gorgeous Diamond Head volcanic cone, known to Hawaiians as Leahi. The view looks like a postcard. It’s a great spot to sip a drink or enjoy breakfast. Access to the lounge is available for guests who book a club-level room or those who purchase a daily access pass (based on availability). I have to say, as beautiful as Waikiki is there is so much more to see of the area just 20 minutes away. One thing I love to do when traveling is to find local favorites for lunch or dinner. We were lucky enough to get an insider’s perspective with our friend and local celebrity chef, Chai Chaowasaree. Chef Chai took us on a food tour that included Liliha Bakery, Helena’s Hawaiian Food, and his own restaurant, Chef Chai. There is just too much to say about the food we ate, so I am writing another article about how to eat your way through Honolulu. The food scene is outrageous in this city. With so many different cultures in one place, there is a need for diversity; you are sure to find what you are looking for. So, besides eating, what else is there to do you ask? Well, if you are an early riser you can organize a tour through the Hawaiian Seafood Council to see the Honolulu Fish Auction. It’s much like the world famous Tokyo Fish Auction and very cool to see with all the different types of fish and the fast-paced auction. Visitors can also check out the Bernice Pauahi Bishop Museum. Museums are not normally my thing, but this is a very cool place and a must if you have kids. Founded by Charles Reed Bishop, the museum encompasses a natural science and cultural history of the islands. I had a great time looking at the displays and hearing theories about where the Hawaiian people originated. A little further out from Waikiki is another part of the island called Kaneoe Bay, where the pace is much slower. Visitors can spend the day out on the Kaneohe Sandbar, where the water never gets any deeper than one’s hips. People pack their boat with coolers and chairs, anchor near the sandbar, and off-load for the day. It’s really beautiful and makes for a great day. Be careful though: There are a lot of sea turtles in the area so you might encounter a surprise in the water. The turtles are protected, which means you are not allowed to touch them. Near Kaneohe is the city of Kailua, where we did some boutique shopping and got shave ice at Kailua General Store. (Yes, it’s “shave ice” not “shaved ice,” and certainly do not call it a “snow cone.”) This is a very special Hawaiian treat. Shave ice comes flavored, and Kailua General Store owner Steve Parker makes all his flavors from scratch. So of course we indulged! Back in Waikiki, we checked out the new and improved Chinatown. In the past, Chinatown in downtown Honolulu wasn’t a place you wanted to hang out unless you were looking for trouble. But now, it’s cool and hip with up-and-coming restaurants and bars. Drinks at The Manifest are a must. Master mixologist Justin Park makes a mean cocktail and does it with flair. I’ve just touched the tip of the iceberg about things to do in Honolulu. I guess I need one or two more trips so I can write about and share one of my most prized places in the world.